Let's start the year off with good vibes, big bucks and playing on a positive note! - Tourney Room. More chances, Bigger prizes this 2018! - DEPOSIT AND REGISTER to unlock this room. Bring in the New Year with a cash Blowout! This event has been so popular that we thought you would enjoy even bigger prizes! Are you feeling lucky? 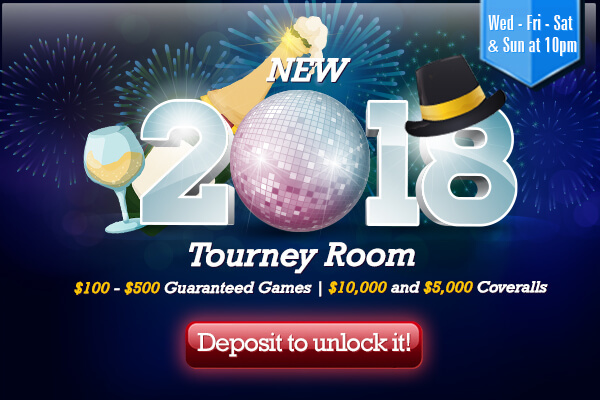 The New Lucky Bingo Tourney Room opens every Wednesday, Friday, Saturday & Sunday at 10pm (EST) throughout January. (Exclusive Room – Deposit to unlock this room). Players need to register with $25 cash. The $25 CASH fee covers the automatic pre-bought cards for all games, including the $10,000 CA, $5,000 CA, and $1,000 CA follow by $100-$500 multipart GUARANTEED GAMES such as the lady bug, horseshoe, shamrock, bingo fairy, rainbow and much more… (Fair and Square/12 cards per game). Ready to make 2018 be your best year yet and do more of the things that make you happy? CanadianDollarBingo is part of the well-established TheBingoAffiliates network and the only bingo site for Canadian bingo players that pays and plays in Canadian dollars.New members get a $50 FREE trial bonus and new depositors an incredible 1000% Welcome Bingo Bonus package. See you all in the bingo rooms! This entry was posted in Blog on Jan 10, 2018 by Canadian Dollar Bingo.